From Guntersville: Follow Hwy 227 through Lake Guntersville State Park, approx 12 miles. Cross 4-lane, go 1/2 mile, turn right onto Old Hwy 227 at Five Points Grocery. Go 1.5 miles and look for Cedarbrook Farm signs on your left. From Albertville: Hwy 431 to Hwy 75N. Hwy 75N to Geraldine, turn left at traffic light onto Hwy 227. Follow Hwy 227 for 9.8 miles, turn right onto Old Highway 227. Go 2 miles and watch for Cedarbrook Farm signs on your right. From Scottsboro: Hwy 35E to County Road 67 (first road to right after BB Comer Bridge). Turn right, follow Hwy 67 ‘til it changes to being South Sauty Road in Marshall County (at South Sauty Fish Camp). Follow South Sauty Road to Old Hwy 227 Road at Five Points Grocery. Turn left and go 1.5 miles. 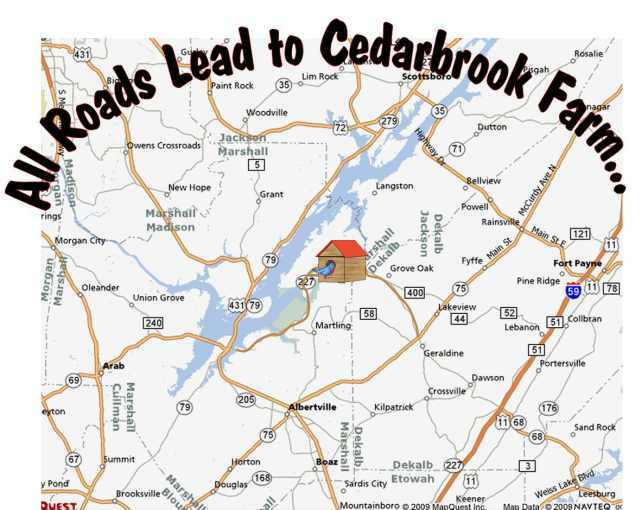 Look for Cedarbrook Farm signs on your left. From Chattanooga: I-59 to 2nd Ft Payne exit, go right on Hwy 35 to Rainsville, left onto Hwy 75 to Geraldine and follow directions as above. From Huntsville: Hwy 431 to Guntersville, follow directions as above.